Harmar’s all new AL500P Profile Folding Platform Lift is the only of its kind in the industry! When unoccupied, the durable aluminum platform can be folded in half for an incredibly low profile, nearly eliminating rear view obstructions. 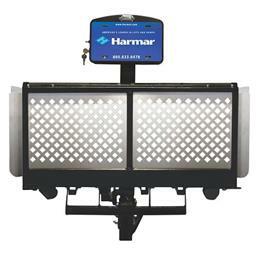 One switch operation and drive on/off platform make this Harmar Exclusive even easier to use! Easy-to-operate, Q’Straint self-tensioning retractors, ensure this lift can safely secure and carry virtually any power chair. Optional folding wheelcradle available for use with scooters.